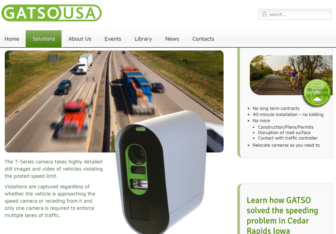 The website for Massachusetts-based Gatso USA shows one of its roadside cameras used to capture images of license plates of drivers who speed. The company is contracting with Oklahoma to provide scanners for detecting uninsured vehicles. Read the full contract with Gatso USA. Gatso’s business focuses on speeding and red-light enforcement, but its roadside camera technology is likely to apply easily to catching uninsured drivers. The key is connecting the system to a continually updated database with insured vehicle owners. Gatso has faced legal challenges in some other states. In Iowa, the state Supreme Court is considering a case brought by a woman who argues her constitutional rights were violated when she was ticketed by an automated Gatso speeding camera. With their state funding in decline, Oklahoma district attorneys are turning to issuing tickets and putting people on probation for a fee. Their newest effort is to crack down on uninsured drivers by scanning the license plates of thousands of Oklahomans on roadways every year and mailing them tickets.